Aberdeen, the third largest city in Scotland, is often overlooked by guidebooks and tourists, and there are good reasons for preferring Edinburgh and Glasgow to Aberdeen. However, now that I’ve lived here for a season and shown the area to countless friends, I would vouch for Aberdeen as a decent weekend getaway. Last month I went on a little Staycation to the city center of Aberdeen with a friend, to try out a hotel and the enjoy waking up in the middle of town. It’s always a treat to spend a night away with a girlfriend, even if you are only a few miles from your house! So here are my suggestions for what to do if you find yourself in Aberdeen, either for a weekend or like me, for a longer season. 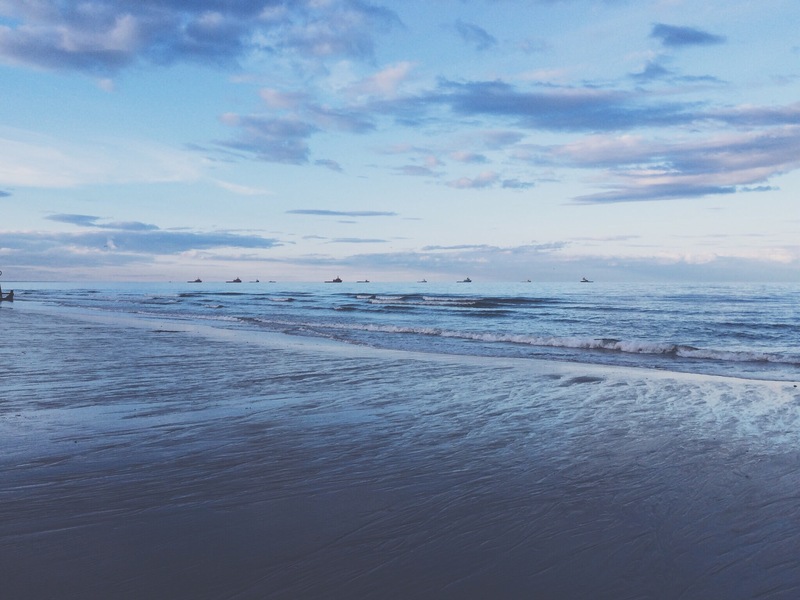 Just a short distance from the city centre, the sandy Aberdeen Beach stretches for two miles between the Dee and the Don rivers. A boardwalk runs just above the beach as well, so you can enjoy the sound of the waves as you linger on the sand, or while you’re pounding the pavement for an evening run. Either way, you’ll love taking in expansive views of the sea, listening to the seagulls and watching the occasional surfer when the winds are high. If you have a car, you should also visit the quieter Balmedie Beach, just a short drive north of the city. Big sand dunes and beautiful waves. This museum traces the history of Aberdeen’s harbor, one of the oldest in the world. The city’s journey from being a medieval fishing village to a powerhouse of industry when oil was discovered in the North Sea is told through multiple exhibits. In the modern day exhibits, you can enjoy seeing what daily life is like for offshore workers. According to the Guinness Book of Records, the harbour boasts being Britain’s oldest business (est. 1136). For certain it is one of Europe’s busiest ports with the constant coming and going of offshore supply boats, ferries and fishing boats. You can stand in the harbour and watch the boats, or walk to the harbour’s edge and try to catch sight of seals and dolphins that often play near the entrance. Footdee (pronounced Fittie) is a small fishing village located south of the city centre by the Aberdeen harbour. The village dates back to medieval times but people still live in the little cluster of cottages that are huddled together with their backs to the sea, as protection from the rising tide and winter gales. The village forms two squares, one around an old church, which also serves as meeting house. 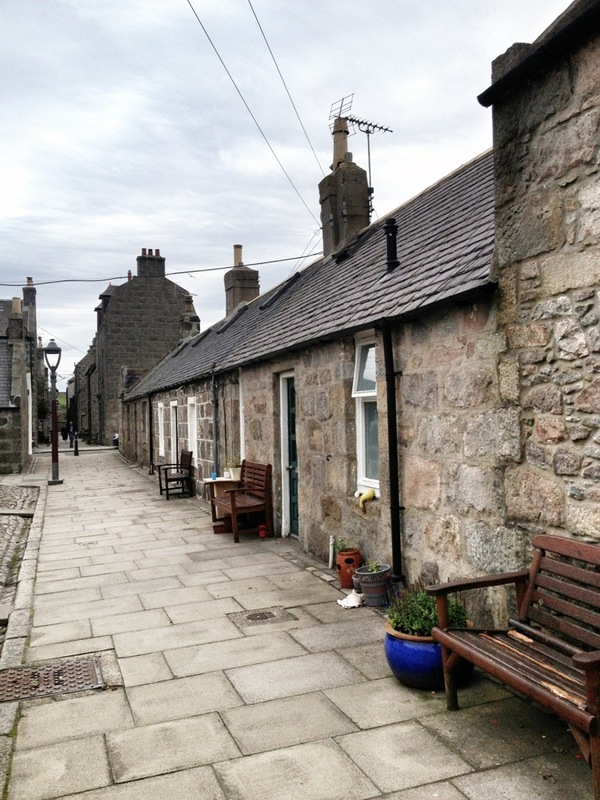 Wandering the village is a fun way to step back in time to the days when Aberdeen’s primary source of income was found through fishing the North Sea instead of mining its oil. A visit to Aberdeen would not be complete without taking a stroll through Old Aberdeen. Located just north of the city center, Old Aberdeen has some of the most exquisite architecture in the city. Don’t miss King’s College, the third university founded in Scotland in 1495 or the beautiful St. Machars Cathedral, which dates from the 19th century. Both are free to tour. Our go to meeting spot for drinks in Aberdeen is a place called Six Degrees North, named such because it is six degrees north of Belgium. Clever, eh? As you might expect, they brew Belgian style beers and always have loads on tap to choose from. They also do a lovely cheese, olive and meat board to share with your friends. We have a few favorite spots to eat in Aberdeen, but we don’t go out to eat that often so I’m sure there are many places I’ve overlooked. For a fancy dinner, we love Cafe Boheme (French) or Rustico (Italian). For a quick bite at lunch or a great coffee, I would go to The Coffee House just off of Belmont or Kilau Coffee at The University of Aberdeen. You can choose from all kinds of different live shows in Aberdeen. Music, theater or intimate comedy setting. There’s one booking spot for all four main venues which makes it simple to browse what’s on. The smaller venues mean you’ll be closer to the stage and the prices tend to be less expensive than big city theaters. Some might argue that Aberdeen’s greatest offering is its proximity to the Highlands. You do not have to go but ten or twenty minutes outside of the city before you are surrounded by the views of Scotland that you always see in pictures. The breath-taking hills of Aberdeenshire are a wonderful place to get lost for a day. 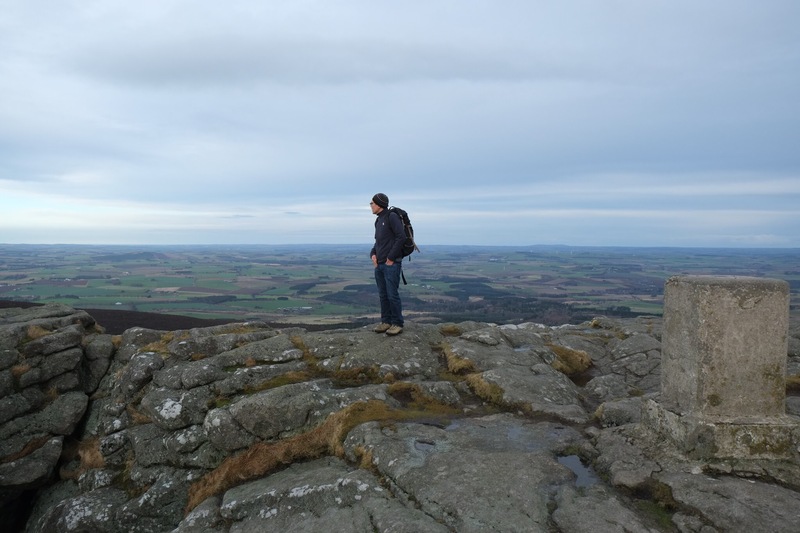 A few lovely walking spots that make great day trips from Aberdeen: Bennachie, Stonehaven, or Crathes Castle and Garden. When you’re ready to turn in after a day of wandering the city, I can recommend the comfy beds at Aberdeen’s Hilton Garden Inn. My friend and I stayed in a King Suite, courtesy of Aberdeen Hilton Garden Inn, which meant we each had our own room. This suite would be perfect for a family, as there was a tub and shower, plus the breakfast is super fancy. SOOOO many choices! 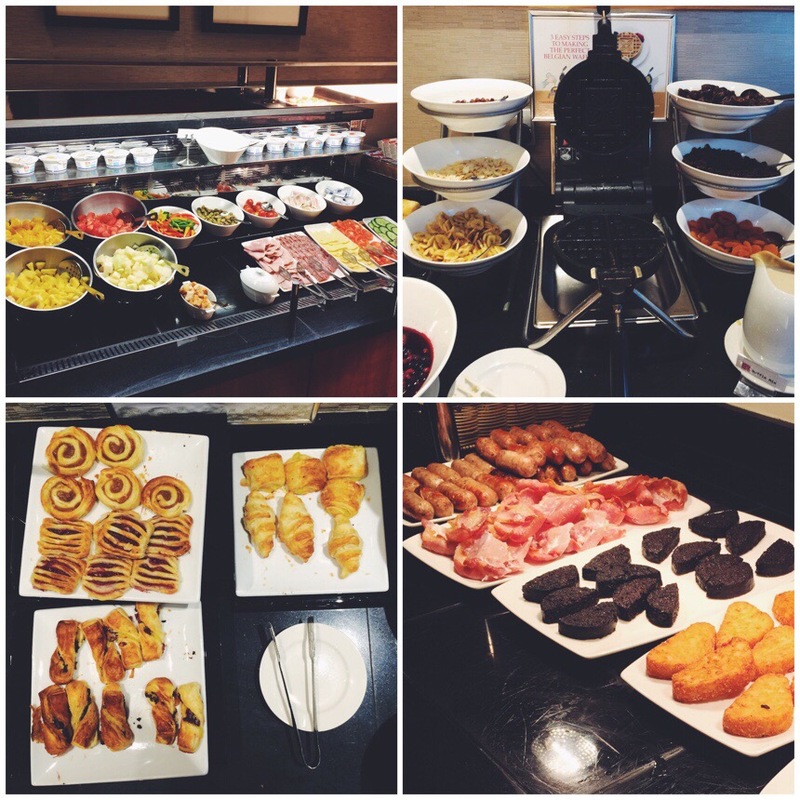 We had Belgian waffles + some extras. 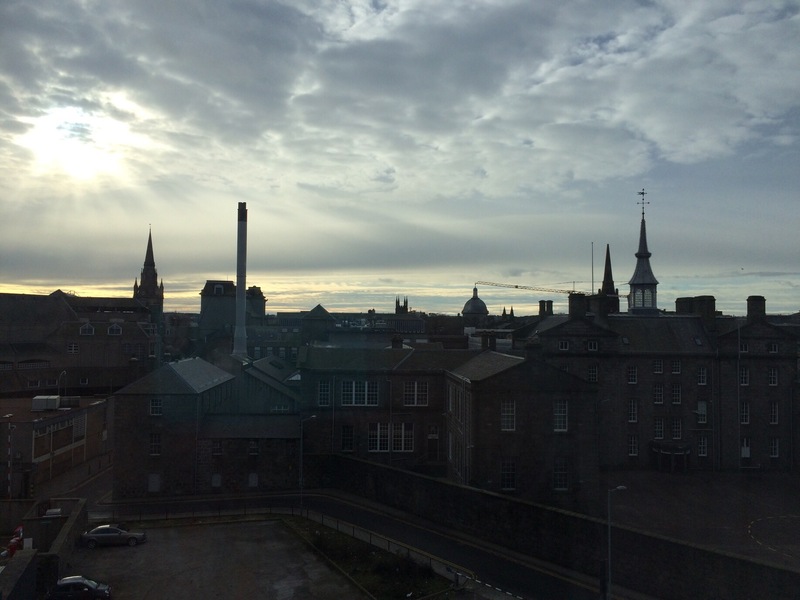 Waking up to the Aberdeen skyline is not too shabby! Disclosure: My hotel suite at Hilton Garden was complementary as part of my Aberdeen Staycation. Big thanks to the folks at Hilton for making our stay oh-so-lovely. You can also see video of our room and breakfast on Vine. PS! Hey Aberdonians! Please weigh in and tell me the restaurants and things I’ve missed in Aberdeen! !